YES, you will meet them all and perhaps you fit many of the models of grocery shoppers I will be talking about today in hopes of helping you understand more about the depths of marketing and self-awareness. When grocery stores work on their marketing plans part of that process involves catering to the different types of grocery shoppers that visit their stores every single day. Marketing teams explore all facets of shoppers because they want to make sure they capture them and keep them coming back for more. This is how money is made all over the world. The reason for this is because different personalities tend to shop differently whether they buy more or less based on the way they take-on the grocery shopping experience. Keep in mind that grocery shoppers may shop based on their generation as well their likes. I read a recent article that said there were 4 types of grocery shoppers. Consider both the Baby Boomers and Generation X who may have more disposable income since one may be retired or are living near or debt free and the other at home with parents or has little to no debt to worry about. This got me thinking about how differently each type of grocery shopper tackles the grocery store beyond the generations. I agree that there are grocery shoppers who want the best of the gourmet world, the tried and true product shoppers, new and upcoming products and of course whatever I feel like for the day shoppers but lets dig deeper than that. What are the primary generations today? To understand the different generations that are filtered through marketing plans you need to know what each represents. Below is a breakdown of these generations and the years individuals were born. Just because you fall into a category that may be the Gourmet Gordon generation it doesn’t mean you will follow spending habits of that generation. 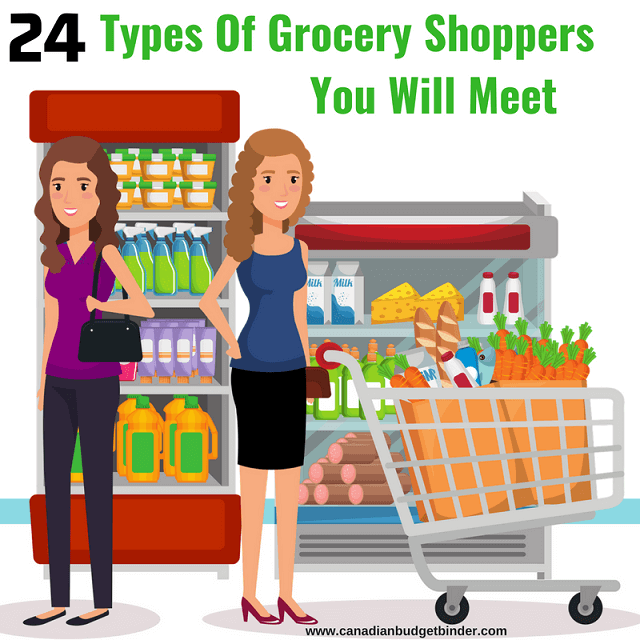 You may run into these grocery shoppers but you ARE going to fall into one or many of these categories which may make you re-consider the way you shop. Below are 24 different types of grocery shoppers that I came up with some in part with my Facebook fans which I’ve quoted at the very end. I’ll admit there are times you can’t shut me up but I don’t often like to stick around the grocery store if I don’t have to. I won’t initiate conversation unless it just happens. If I see a colleague or friend I try to do the happy nod and get on with my shopping. If I haven’t seen someone in a long time and bump into them at the grocery store I won’t be rude and will take a few minutes to catch up and perhaps set a coffee date up instead of aisle blocking the other grocery shoppers. Keep it simple with chatter or plan to spend more time shopping. Everyone should be using a grocery list and know how to navigate it. Ideally planning your grocery list should be done by department if possible. If you know the layout of your usual grocery store it will be effective to list what you can in order of what you see when you first walk in the store. You may not get foods down the aisles right unless you take a photo of your phone or write them down so you know how to plan your shops the next time but easing the process helps. Don’t be afraid of the list shoppers they generally know what they want and like to get in and get out. These are the grocery shoppers who like to shop and search social media at the same time, talk on the phone, have kids in tow or are arguing with family or relatives. It happens ALL THE TIME and although using your phone to help your grocery shopping experience is smart sometimes it’s best to park your cart out of the way and let other shoppers do their thing. I’m sure all parents will agree that bringing your children to the grocery store can go one of two ways, good or bad and for the most part our son loves grocery shopping. I find it a great way to teach him how to spell and to learn about foods and the shopping process. This may fall into the grocery shoppers who slow everyone down list as well but there’s no denying kids are distracting. I don’t think all judgemental shoppers mean to come across as rude but for the most part it can be taken that way. If someone tries to give you a lesson on nutrition because they see what you have in your shopping cart and it’s not to their liking they may seem judgemental. If someone has something to say about they way you dress, talk or act at the grocery store they may come across as judgemental. These types of people need to be above everyone else and in control but most often prey on easy targets or act as if they are confident but in reality it’s something they lack. Don’t let them get to you, just get on with your day and smile. These are the grocery shoppers that are doing it alone for the first time or they are relatively new on the scene. It’s almost as if you’ve reached adult-hood once you do your own grocery shopping because you don’t need your mom and dad with you. Newbie grocery shoppers may have confused looks on their faces and seem lost at times because like with anything new it takes experience and this is one chore that they will learn and fast. Get me this, get me that, hurry up, I don’t have all day, you are too slow or get me the manager. You will be witness to it all or you are this person. These types of grocery shoppers take no $hit from anyone and will say what they feel or want no matter who they hurt. Yes they exist and most times it’s the staff at the grocery store who will have to tackle these types of customers with a smile. Don’t let one or a few bad apples spoil your day. The rude shopper is just that, unapproachable and has a distinct look of disgust on their face because you or someone else did something they didn’t like. They will stop at nothing to let them know even if it causes a scene. Don’t try to escalate with these types of people as they are comparable to road rage and not worth your time. We’ve ALL been there. You say you’re going to run into the grocery store for one thing and don’t grab a shopping cart or basket and end up with armfuls of products. The worst part is waiting in line and feeling the pain of wanting to drop everything on the floor. For the most part if I stop to chat or have to use my manners at the grocery store I’ve always met with polite grocery shoppers. We need more grocery shoppers to understand that although grocery shopping is a chore it doesn’t have to be a rusty one. Smile if you want to but if you’re not in the mood just be polite and get on with your day. Now, we used to be heavy coupon shoppers back in the day but we notice that in 2018 coupons aren’t as heavily used like they were say back in 2010-2012 before manufacturers got sticky about the wording on the coupons. Back then we had heard every nasty comment in the book when we were trying to cash out and yes we have been in a mini-confrontation with a lady who was rude with us. That’s where we’ve learned to just smile and let it go. If you bite into the evil apple it will bit back. Smile and that will piss them off enough. If they don’t like coupons go to a different till but it is your right to use them whether you have 1 or 100. These grocery shoppers not only focus on shopping for themselves but for everyone else. If they see you put a product in your shopping cart they may tell you not to buy it and the reasons why. Although many people are just trying to be helpful there are grocery shoppers that aren’t interested in hearing product reviews for what they plan to purchase. Unless you are asked or it pops up in conversation, keep it going. These types of grocery shoppers want discounts on just about anything they can and will stop at nothing to ask for reductions. Fair enough if the reduction is warranted but being petty just to get a discount can get annoying especially when the grocery store gets to know who the discount grocery shopping trolls are. Get the heck out of my way or I will run you over with my shopping cart is the name of the game. These types of grocery shoppers don’t want to waste a minute of time and want in and out. Steer clear and let them be on their way as long as they aren’t pushing you to move faster than you want to. We all have a right to shop as fast or as slowly as we please. This is the grocery shopper whose eyes are always on their grocery list or the products and have no inclination to make eye-contact with anyone because they don’t want to talk. Sometimes the best way to avoid other grocery shoppers is to mind your own business and just get on with it. These types of people think nothing of opening a package to start snacking before they buy it and I’m not talking about offering a cookie to a child who is not in the mood to be grocery shopping. You may also find these grocery shoppers like to multi-task so they take their lunch from work or home along with them and grocery shop at the same time. Perhaps this is a smart way to grocery shop since you won’t be hungry and spending more than you need because you’re already eating something. This is the grocery shopper who has no clue where anything is in the grocery store and has to find help from customer service staff on the floor for simple everyday items. It’s OK when you don’t know where one or two things are but generally consider the department the item may be in and look at the aisle hangers with product lists to help shoppers navigate the grocery store easily. If you work in a grocery store you might know these grocery shoppers as the “Where is it located?” shoppers. These types of grocery shoppers are the worst at making decisions because they toggle between the yes I need it and no I don’t. They are uncertain about what they are buying which slows down their shopping process. Keep in mind that just because you experience slow grocery shoppers that they may have a disability whether visible or not that prevents them from moving faster than you. Not everyone grocery shops at the same pace and not everyone is in a rush or has all the time in the world. Patience really is a virtue or find another option. These shoppers are looking for ingredient lists, manufacturing, date codes, counting calories and some take it one step further and start to Google what they don’t know. You will find them all over the grocery store and not just in the health food section as some would think. You have either been a shelf or aisle-blocker before or experienced one. This is one of those awareness things that we all need to keep in mind when grocery shopping. It’s so easy to fall into another world when grocery shopping especially if you don’t have a meal plan or you are the type of shopper who daydreams about cooking as they shop. If someone stops you to talk be aware of your surroundings and move as soon as you see someone coming close because they may want to get to the shelf but you’re in the way. Not everyone is confident to speak up either so it’s not a case of they can tell you and you will move, just move. You my friends are too good to be true but you love life, grocery shopping is fun and nothing bothers you at the grocery store because you let it roll off your back. We need more grocery shoppers like this. You know who you are. Putting back the shopping cart is a task as is finding a garbage can or placing products back where they came from if you decide not to buy them. Stop being this type of grocery shopper and smarten up. We all pay the price for your laziness. Often I wonder if these types of grocery shoppers are the smart one’s especially on days when I run into someone who is not so nice at the grocery store. With the rise of online ordering for groceries these grocery shoppers click and collect their groceries without stepping foot in the shop. The don’t have to deal with any type of grocery shoppers at all.. I have no time for a cashier or I’d rather just scan my own grocery shop and get on with my day. You either love them or hate them but the self-scanners are here to stay. You may start to see them pop up in almost all fast-food restaurants and even Shoppers Drug Mart has jumped on the bandwagon. I don’t mind using self-scanners when I don’t have any reduced items in my shopping cart because if I do it takes far longer to get cashed out waiting for a customer service rep to over-ride deals. Some stores are now letting the customers apply the discount code without help likely for this purpose. I can see more self-scanner fraud happening this way though. When we go to Costco they offer samples all over the store but when you go to a typical Canadian grocery store you might only find sampling on weekends which is the busiest shopping days. Apart from that you have certain grocery shoppers that must taste everything thing they are buying before the buy it. Consider if you were working in the deli department and every other customer wants a slice of deli meat or cheese they may want to buy before the buy it to taste test. Not only does that slow down customer service flow but it is costly for the grocery store. These types of taste testers cost the store money whether they buy the product or not. Is it there right to taste the food they buy? Well, in my opinion you either take it or leave it. You shouldn’t ask for freebies. If you don’t like a product, oh well. Most stores will allow you to return what you don’t like if you have the receipt. You my friend are the person who is in the midst of getting checked out and you say, “OH, I forgot a loaf of bread” and have to make a mad dash across the grocery store bowling down other customers to get that one loaf of fresh bread. It is what it is and it happens but it’s just annoying to wait. You may start to hear the huffing and puffing at this point from other customers in line. I don’t know what it is but just about everywhere we go shopping including the grocery store we have to park somewhere close to shopping carts or an area that is distinctive in nature. The reason is when we come out of the shop we can’t remember where we’ve parked. It got even worse once we became parents because we are always so focused on our son but generally these days we park far away, near the shopping cart depots or generally where no one else likes to park. If you stay away from the masses it’s easier to spot your vehicle. At Costco for example we park at the very back where you will hardly see any vehicles. Always the run into the one that blocks the aisle yapping…..I don’t mind if you visit just don’t take up the whole aisle. I am on a limited time-frame when I get to the city to shop and yes I will admit it I am that person that says,”Lead, follow, or get the hell out-of-the-way” that can be heard 6 aisles over.- Colleen K.
I use a motorized cart when I shop, and the shoppers that get me are the one who “sneak” in front of you or just blatantly walk in front of you and then accusing say excuse me? Like it was my fault. I am a careful driver in my cart. I always let walkers go ahead of me at the end of the aisle so I can turn down if I need to. I also let people with fewer items than me go, cause I’m sitting.– Pam B. The coupon shopper! I have been that lady! Coupon for every item, binder, list, calculator. I respect them, but I don’t want to be behind them in the checkout!– Cynthia S.
The shoppers that I run into most, and the most annoying, are the ones who block off a section so only they can look the area over. I simply won’t put up with it. I politely squeeze in to get what I am looking for and then move on. I also can’t stand two shoppers going in both directions who will stop in the middle of the aisle to gossip. That’s when I start saying “Excuse me” in ever louder tones until one of them moves. I don’t believe in being rude but I do want to get my shopping done before the day is over. I also realize that there will be times when I do the blocking too so I don’t feel offended when some one asks to get by me. Fair is fair.– Thad. T.
Honestly when I shop I get in and out as fast as I can without taking much notice of other shoppers. I mostly hit the outside aisles where they are wider and quicker to get through. When I hit the grocery store I try to look like I’m in a hurry and late for an appointment so people know I don’t have time to visit. I work in a store all day so I don’t like spending too much time in them after work.– Pat C.
The judgemental shopper: comments on the items in your cart. You must be feeding an army? Do you like that brand? My (fill in the blank) will only eat name brand whatever. Wow, you sure eat a lot of vegetables, are you a vegetarian?- Cynthia S.
Join the 2018 Grocery Game Challenge (GGC) but before you do you must read The Grocery Game Challenge Rules and Print the 2018 Schedule which includes new prizes! Free Money Saving Downloads are awesome lists created to get us on track working towards reaching our budgeting goals and now we are sharing them with you. Everything you want to know about grocery shopping in Canada is packed into this amazing FREE grocery shopping guide that has taken 6 years to create. Yearly grocery budget for two + 1 Toddler 2018: $3600 or $300/month (The above total does not include the stockpile budget of $300/year or $25/month. Note: All totals below already have tax factored into them. We are over for the month already which means next week is a no-shop week unless we need milk. My wife still has a $25 PC gift card we can use if needed . We went in for milk, eggs and cucumbers and came out with a tonne of deals to the tune of almost 97% discount. I will likely write a post about it sometime as it was our best shop to date without coupons. If you minus the points earned we still would be under budget for the month. With over 3 million PC Points we’d say we’re doing well, but still try to stick to the budget as much as possible. Awesome shop in my opinion. It’s not every day you run into that many 50% off items and there was so much more. Now I know Monday’s are a good time to shop or at leas in the morning. Here are some great places you can find Canadian Coupons! These are your latest Checkout 51 offers which you can use to help save money. Where can I find Canadian Coupons 2018? Plus check out these other hidden portals online to get more coupons!! If any of the links below don’t open properly please report them to my email address or use comment form. Grocery Game Challenge RULES: Read the rules first and if you have any questions email me or comment on this post with your question and someone will answer you as soon as possible. The rules have been updated to reflect changes for the 2018 challenge year. What is prize payout?- I’ve changed the prize to yearly so I’ll be tracking everyone’s shop and draw accordingly for larger prize payouts. When does the Grocery Game close each month? Ideally you would want to have all your shops in by the end of the month for review in order to make improvements for the next. Does your Grocery Budget include health and beauty and laundry products? : No, our Grocery Budget does not include such items as shampoo, conditioner, laundry soap, fabric softener, dish soap etc. As of 2014 we no longer included such items in our grocery budget so we could see our actual food numbers at the end of the year in order to plan accordingly. What is an FPC? : An FPC is a free product coupon which means you can get a free product as described on the coupon. Some of these coupons have an expiry date and others no expiry date so be sure to check. If you want to learn everything I know about grocery shopping in Canada check out my Ultimate Grocery Shopping Guide! You’ve made a wise decision to take control of your grocery budget now show me your shops and let’s get saving! Welcome to The Grocery Game Challenge 2018! I fall in between fast, busy and lost. In my University days, I was the fast shopper as I had to rely on the bus. As soon as I got off the bus, I only had 45mins before I could catch my next one (not including the 5min walk from the store to the bus stop so really, only 35min to shop). Otherwise, it’s an 1.5 hr wait which is miserable in the winter. That was my fast shopper days. Nowadays, I’m more in between busy and lost. I’m there to get groceries and get out (no dilly-dallying) but my store has expanded so much and renovated so many times that I often have no clue where certain items are if I don’t get them often. I’m drinking ice water like nobody’s business this last month! The warm temperatures leave me thirsty but definitely not interested in food. I find when it’s hot, I eat breakfast, have a cup of fruit at lunchtime and just mug after mug of ice water after that. It is almost time to re-stock our crispers but this week we focused on re-stocking our drinks supply. OUR CURRENT TOTAL UNUSED RESERVES ARE $1,713.09. This means the 1,761.30 that we carried forward from 2017 PLUS AN ADDITIONAL $1,122.78 that we have added in 2018, LESS $1,170.99 that we have drawn out for use in 2018.